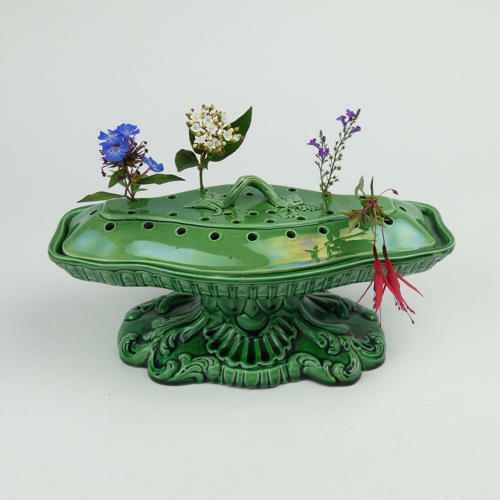 A most unusual, green majolica glazed violeteer. This piece is marked 'COPELAND & GARRETT LATE SPODE' in a circular mark and it dates from c.1840. This mark was only used from 1833 until 1844. The majolica glazed wares tended to be restricted to dessert and table wares and it is not common to find decorative items. This piece is a really unusual shape and we have never seen one before. It was designed to hold water and flowers would be arranged through the pierced lid. Both the base and the lid are very ornately moulded. There are a couple of very minor faults to the base. It has two very small areas, each no more than 6mm by 5mm, where the glaze has rubbed and there are two tiny chips, one on the foot and one on the rim. The lid is in good condition.